Enjoy the classics? Get Federal's most proven load. GREAT PRICE! The loads that have put meals on tables for generations! Federal Classic Loads are medium weight shot and power loads that provide excellent performance with moderate recoil. You can't go wrong with a classic! State Shot Size, as available in the Shopping Cart. Order Today! 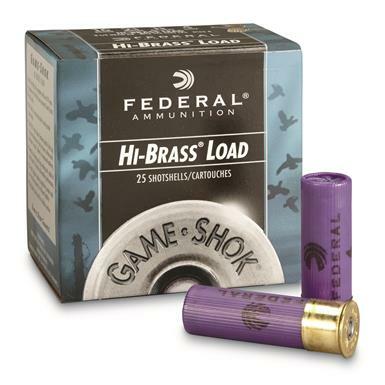 Federal Classic, Hi-Brass, 16 Gauge, 2 3/4 1 1/8 oz. Shotshells, 25 Rounds is rated 5.0 out of 5 by 11. Rated 5 out of 5 by Jeff at Cross Lake from Great Shell I have always pretty much used Winchester shells, but I bought these this year and so far I am at 100% shooting partridge. I like the Hi-Brass and I like the purple color. The cost is right and they perform great. I would definitely buy again. Rated 5 out of 5 by Kenn from Still my choice of all 16 gauge shells Federal in my opinion is the manufacturer of the highest quality 16 gauge shotgun shells. Rated 5 out of 5 by JOHN THE FOX from KILLS SQUIRLES WELL! IF YOU HIT THEM IN THE HEAD THEY ARE DEAD! 70YD SHOTS ARE NOT OUT OF THE QUESTION WITH THIS LOAD! Rated 5 out of 5 by MARK R from Good ammo. We inherited an old Mossberg Model 190 in 16 gauge, so we had to order some ammo as we don't have that gauge in this house. The brass for the shotshells was thicker than the slugs we also bought and the bolt had to be forced closed to accept it. Yet all worked out fine. Shell Weight: 1 1/4 oz.